Gordon Hempton is the type of person who gets into something and doesn’t let it go. As an acoustic ecologist, most of his obsessions are sounds. Specifically, natural ones. Hempton’s been on a crusade for years to highlight the sonic beauty of the natural world, and draw attention to the fact that we’re slowly letting that beauty disappear in a sea of noise pollution. Along the way, he picked up a mentor who has helped inspire him and open his ears to nature: naturalist Jon Muir. Though he’s been dead for more than 103 years, Muir has helped guide Hempton, who has walked in his steps literally and figuratively. Muir was central to getting Yosemite set aside as the second national park, and defining our relationship with nature through his prolific writings. But Muir also left behind an under-appreciated legacy of writings about the sonic beauty of nature. His most famous quote, “the mountains are calling and I must go” hints at his love for sound. Hempton traced Muir’s route from San Francisco to Yosemite on foot in the early 90s, sleeping under the stars and the occasional railroad bridge. He’s recorded sounds in Yosemite many times since, as well as in Olympic National Park, which he lives outside of today. 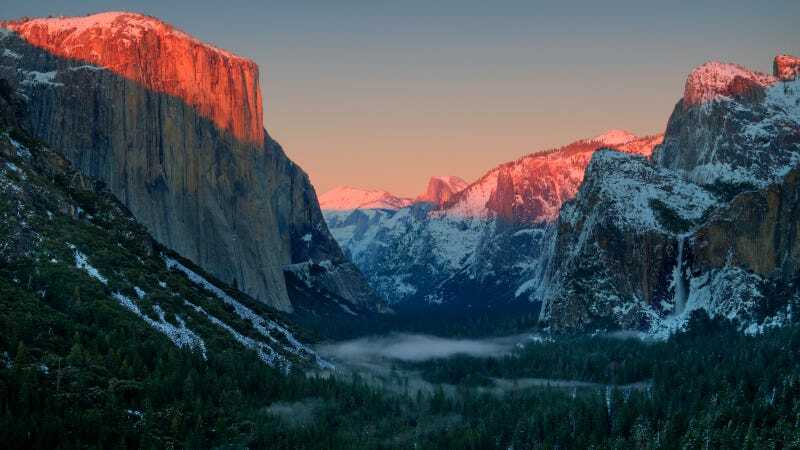 The sonic landscape has certainly changed over time, with Yosemite today featuring bustling trails in the summer, traffic jams, and commercial jets regularly flying overhead. By going to remote places and using sensitive recording equipment, Hempton has managed to isolate snippets of the natural world described in Muir’s writings. Muir once wrote in his journal that he heard “snow melting into music.” The turn of phrase immediately piqued Hempton’s interest. Sure, snow may make little drips here and there, and runoff in the spring can tinkle through mountain meadows, but melting into music is an otherworldly description. Hempton was searching for a snow symphony while walking in the Olympic Mountains when he happened upon a cavity in the snow roughly the size of a human head. He stuck his recorder in and what he heard shocked him. A rhythm and cadence that you can nod your head to materialized out of seemingly random noise. Tuolumne Meadows is near the crest of the Sierras, dotted with granite domes and criss-crossed by streams and rivers. Soda Springs burbles up just north of the Tuolumne River. Today, it’s enclosed by a fence, but it was unobstructed in 1889 when Muir set up camp during a formative trip to the Sierras. On that trip, he was convinced to join the fight to have Yosemite designated as a national park. Hempton wanted to know what convinced Muir to take time away from his ranch and outdoor adventures he loved. So, he made a trip to Soda Springs on a winter night decades ago. Hempton lowered his recorder to the ground near the spring, and that’s when he felt he understood what inspired Muir to fight for Yosemite National Park. Muir also led Hempton to his favorite bird. The water ouzel, or American dipper, is common across the West. It hangs out in streams and hunts aquatic insects. It’s also quite skittish and doesn’t let people or potential predators get too close. Muir devoted an entire chapter on the bird in his writings. In it, he spends paragraphs describing its song in incredible detail that indicate he was able to get close and hear it over the roaring bodies of water that can muffle its call. A loud, bubbling song that carries over the noise of rapids. Call is a sharp zeet. Hempton knew some rocks on the Elwha River in Olympic National Park frequented by the bird. Take a listen and judge for yourself whose description is more accurate. Muir called the Merced River one of “the most songful streams in the world.” It drops from the high Sierras over Vernal and Nevada falls and into the Yosemite Valley. Along the way, it sings different tunes that each have a story to tell. Hempton commemorated Muir’s mellifluous river in a piece called Song of the Merced that seamlessly tracks the river’s changing voice and character. For Hempton, listening to these sounds offers a reminder of why we set aside parks in the first place. His Muir recordings are just the tip of a huge body of work on natural sounds around the world, and his quest to ensure they don’t disappear in a wash of white noise that’s increasingly polluting our daily lives. Ask The Salty Waitress: What can I do about this crazy loud restaurant?